Ok, I'm kind of cheating a little bit here because this isn't exactly a comic book, it's actually a magazine, but Warren Publishing kind of cheated a little bit too to work their way around the Comics Code Authority. Let me explain how, but first a little history. In 1954, Dr. Fredric Wertham published a little something called "The Seduction of the Innocent". Maybe you've heard of it? In SOTI, as it's become known, he claimed that horror and crime comics were the direct cause of juvenile delinquency. 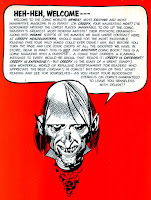 The Senate used Wertham's words, and the Comics Code Authority was created. 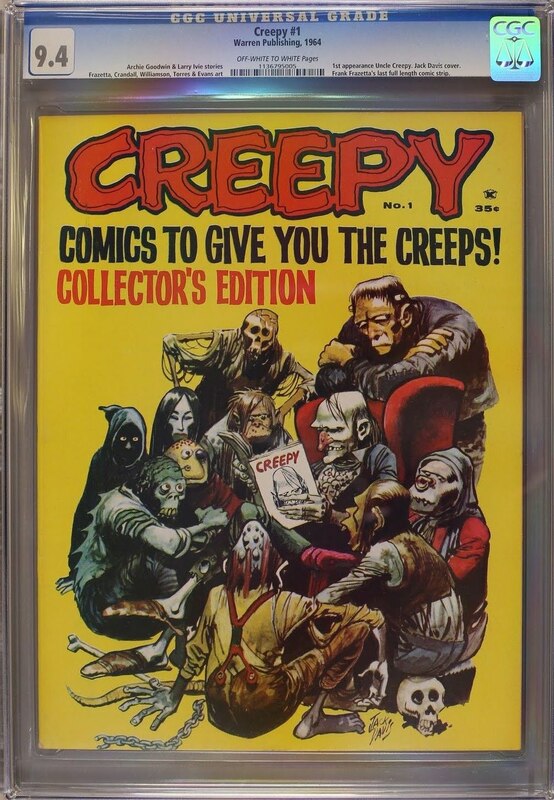 The Comics Code's job was to edit and remove content from comics that they deemed inappropriate, and that meant horror comics were no longer published since they were by far the most inappropriate of all. So, about a decade after the Code was established, Warren Publishing decided they wanted to bring back the very popular horror genre of the 50's, but they couldn't publish them in comic book format, so they published them as a magazine. They could get away with it because the Code only related to comics, not to magazines. So, now that you know why this is a magazine and not a comic, let's talk a little bit about it's key issue-ness. First and foremost, it's the first issue to the series. That one's a given. 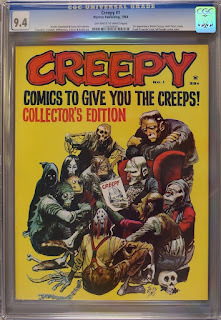 The second is that it holds the first appearance of Uncle Creepy. 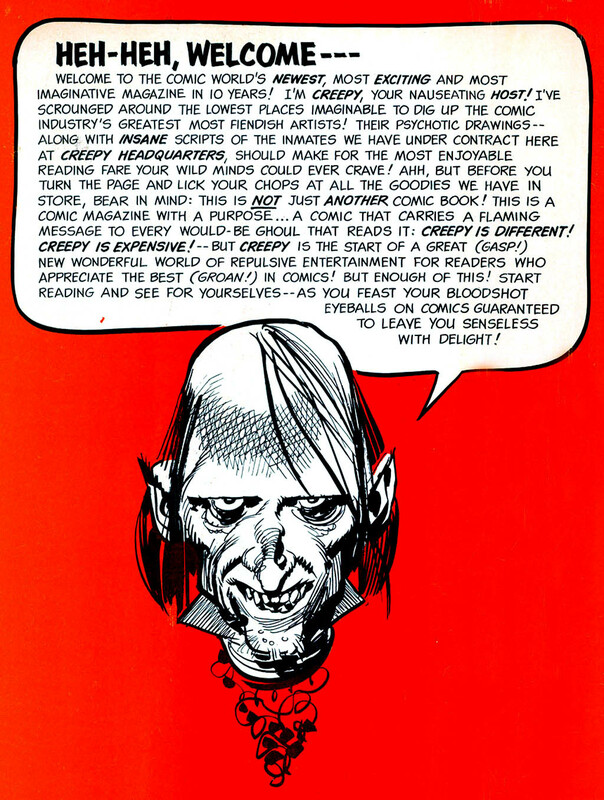 Uncle Creepy is the host and storyteller of the series. He is what the Crypt Keeper is to Tales from the Crypt or the Vault Keeper was to the Vault of Horror. He introduces all but one of the six stories that are in this magazine with a bit of wit and humor. 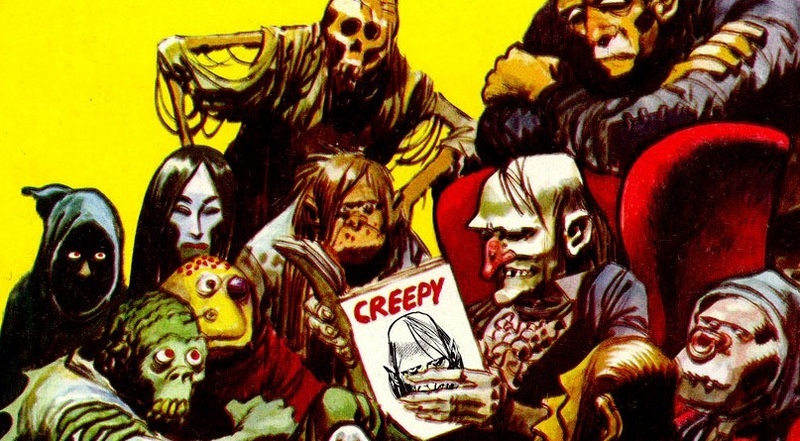 It would seem that the powers that be were able to get some of the top artists and writers, like Jack Davis, Joe Orlando and many more, that made the EC Comics so popular. It seems to me like Warren Publishing was trying to pick up right where EC left off. Many of the stories in this issue of Creepy have to do with the old horror stories of vampires and werewolves. There is a voodoo story and also a story that features the now extremely popular zombies that are out for revenge. This story reminded me a little of the movie Creepshow. If you like horror comics and are able to find a copy, It might be worth a read. It didn't find it a captivating as some of the 50's horror titles, but it's not bad. The black and white format kind of took something away from it for me. Don't get me wrong, I still loved the artwork, but having it in color is just my personal preference. I have no idea what kind of print run Creepy #1 had. If you look at the CGC census, you might think it's low. There are only 267 copies listed there so far. But with a quick search online, there are still a lot of raw copies floating around, so just how low the print run isn't really easy for me to figure out. I'm surprised at how many super high grade copies are out there for this book. Most of the copies listed on CGC's census are between the 8.0 VF to 9.2 NM- range. There is one 9.8 NM/M copy and three 9.6 NM+ copies listed. I wonder if it's harder to keep magazines in as good of condition as it is comics. Or did people not as careful with the magazines as they were with comics. Values for this book haven't really changed that much over the last few years. A 9.4 NM copy sold at Heritage for $418.25 back in 2012, and the latest sale for the same grade on eBay dropped for only $415. There was a copy that almost reached the $600 mark via auction on eBay in early 2014, but obviously that value didn't hold up. If you're looking for a nice high grade copy, don't expect to pay more than $400-$420. However, if you're looking for a copy and are on a budget, you should be able to snag a nice 8.0 VF or 8.5 VF+ for less than $100, you may want to check out raw copies too. Most of those I found available are well under the $100 range, but buyer beware. Now, there's no hype about a Creepy movie being made or Uncle Creepy appearing in his own show and I don't expect there ever will be, so don't expect this comic to blast through the roof value wise anytime soon. But, if you're a fan of horror comics, you may just want to pick up a copy. I may just take my own advice on this one.